Rubber speed bumps and car stops have solved many of the problems associated with the asphalt and concrete versions of these products. 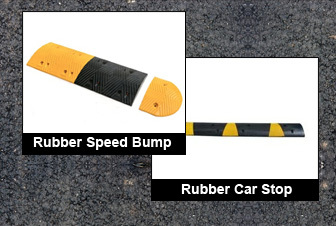 Rubber speed bumps and car stops are extremely durable and resistant to breaking and chipping. They are lightweight and can be installed by one person on any road surface. This results in a dramatic decrease in installation costs. Unlike their concrete and asphalt counterparts, rubber car stops and bumps will not cause damage to vehicles and their color wil not fade so their visibility will always be good. This is especially important at night when visibility is more limited. Additionally, rubber speed bumps and stops can be moved easily. Concrete speed bumps are permanent and difficult to remove. When trying to remove a concrete speed bump, it may be necessary to close the road temporarily, another added expense. All around rubber speed bumps and car stops are a better choice for traffic control. The cost, labor needed, durability and ease of moving these products is a great benefit.